After not receiving payment from its client, the law firm that represented Proview in its Chinese trademark case against Apple has done what it does best: sue. Sina Tech (translation, via Engadget) reports that the Grandall law firm filed a suit against Proview last week laying claim to its four percent commission on the $60 million settlement. Proview had sued Apple in China with allegations of infringement on its trademark. Reports that the two companies had reached a settlement first emerged in early July. According to the Sina Tech, founder Yang Rongshan called Grandall’s legal complaint “nonsense” and said his company would refrain from “bickering” over the settlement. Yang claimed that Proview is not currently under “normal operations” and is therefore not obligated to prioritize the legal fees. The company, which used to make LCD monitors, filed for bankruptcy protection in 2009 and is said to have owed as much as $400 million to a number of powerful creditors, including some of China’s largest banks. 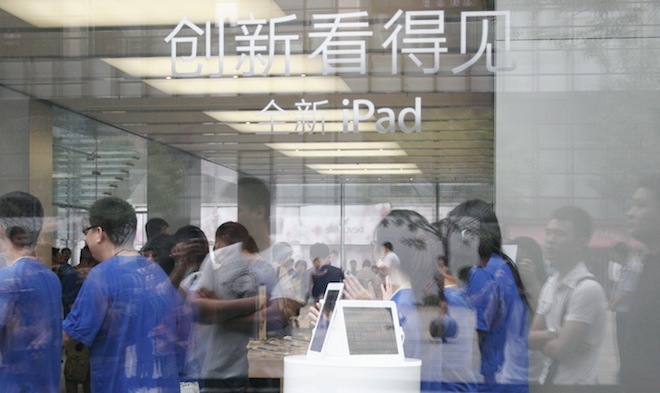 With Proview’s lawsuit no longer looming over iPad sales in China, Apple launched its third-generation iPad in the country last week to relatively tame queues. A reservation system put into place by the company appeared to have been successful in blocking scalpers from snatching up available stock as they have in previous launches.